Under Armour and HTC's debut wearable doesn't hold up to the media-rich experiences found in watchOS or Android Wear, but it could be just what the fitness community has been waiting for. Update: The Under Armour Band has made its way into our list of the best fitness trackers that you can buy. Why? It's fully-featured, super comfortable and the companion app, UA Record, is robust to cover the work-out activities you love to do. To say that HTC has taken its time before making any sort of move in wearables is an understatement. 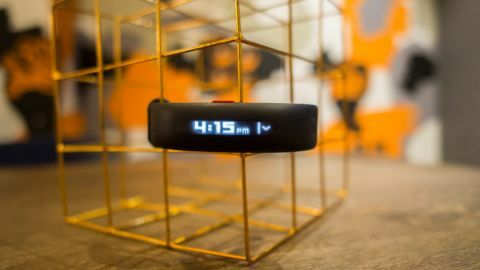 During the scene's explosive formative years, the Taiwanese hardware giant idled while companies like Fitbit, Jawbone, Microsoft, Apple and Google ran full-speed, shuffling to raise the bar over each other. Now, HTC is teaming up with Under Armour, one of the biggest names in performance sporting goods, to create a $180 (about £126, AU$262) fitness tracker called the UA Band. While not particularly impressive compared to modern smartwatches like the Apple Watch or the Samsung Gear S2, it blends the best that the category's old guard has to offer with a smart companion app called UA Record. Plus, it makes tracking and accomplishing your fitness goals painless and rewarding. Fans of the HTC Grip's low-res rectangular display that was shown off at last year's Mobile World Congress will enjoy what the UA Band has to offer. That's because the Band, more or less, is the Grip. Or at least, what has become of it. The 1.3" PMOLED touchscreen certainly doesn't scream quality at first sight, especially with big-name contenders in mind, but UA and HTC's slick presentation of the on-screen elements is simple and efficiently mapped-out. Giving its red button a press brings the touch-sensitive display to life and shows the time by default. From here, you can easily drill down into another level of the user interface with a tap, or navigate between each easily, with a swipe of the finger to the left or right. The seamless PMOLED screen beams tweakable strengths of soft, white light and the animated transitions baked into HTC and UA's "Real Time OS" are fluid. (Though, you'll be disappointed if you're hoping for Pebble Time-levels of panache.) The color palette is certainly limited here, but to have everything readable at-a-glance is a trade I'll gladly make over some potential battery-draining flourishes.